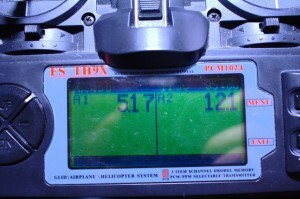 A perfect companion for your modded Turnigy 9X transmitter is the FrSky RC system with telemetry. 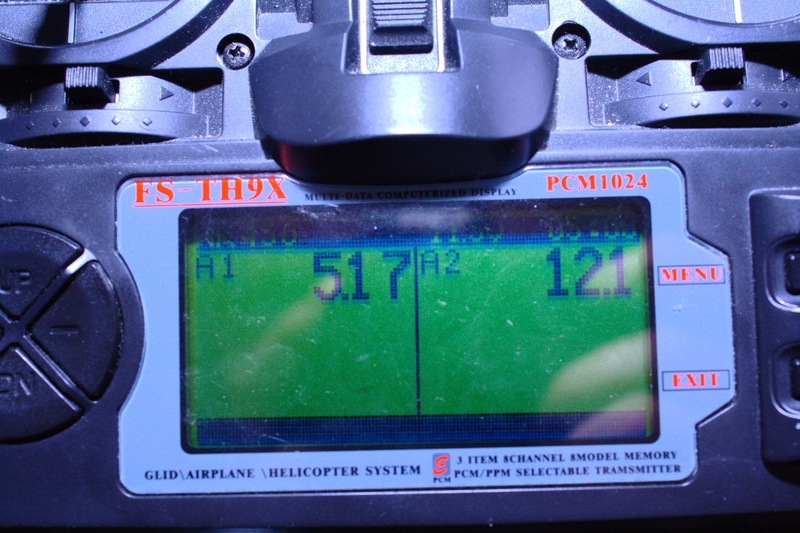 FrSky system supports sending telemetry data back to the transmitter module from the actual model you are flying. By default the D8R-II plus receiver supports two ADC ports (A1 and A2) and a 9600bps serial connection (through which you can send pretty much anything). The A1 port is pre-configured to include a 1:4 voltage divider, and with the jumper it comes with from the factory it measure s the supply voltage for the receiver. The A2 port measures anything between 0 and 3.3V and has no built-in voltage divider. The er9x and open9x firmwares have versions which support the FrSky telemetry functions which enable you to display telemetry data on your transmitter and configure alarms. 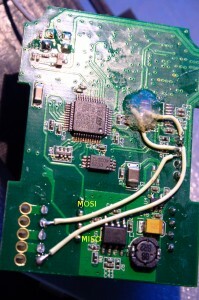 Note: The yellow MOSI line points to the wire which goes to the MOSI pad under the MISO wire, not the the pad under the MOSI wire. You just basically “remap” two switches (Ail and Thr switches I think) from the MOSI/MISO pins on the AVR to two unused pins. Notice the hot glue! I strongly suggest you somehow glue the wires or else they might fall off from vibration. Then we are going to use the MOSI/MISO pins for the serial communication between the FrSky module and the AVR. 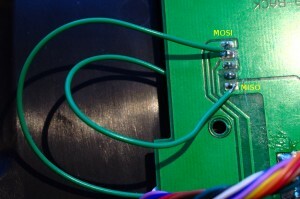 The MOSI/MISO pins are also shared with the ISP connection. 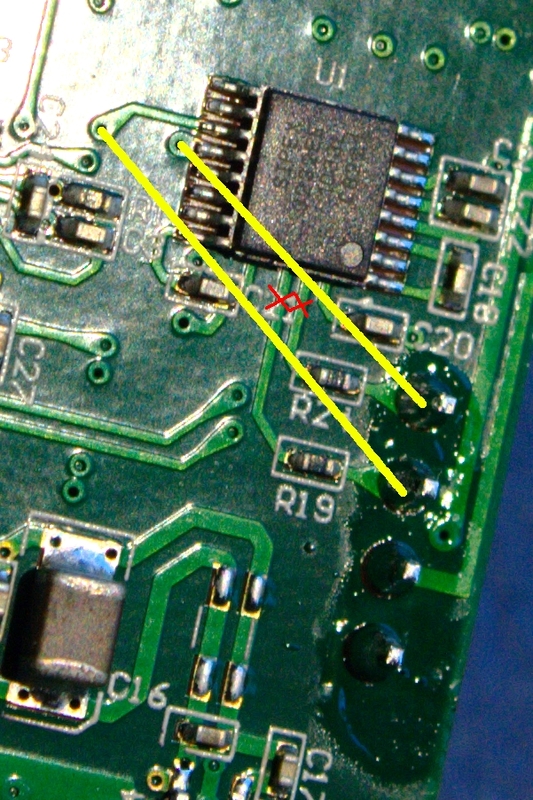 As you can (hopefully) see from the picture you need to cut the traces going to the second pin from the top (originally used for 6V supply voltage on the original JR system, unused and grounded in the turnigy 9X) and the last pin (used for the FM antenna). Notice that the second pin from the top is ALSO connected to the ground layer from the other side of the PCB! You must cut those traces as well. 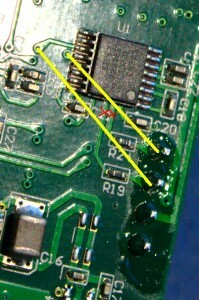 Use a multimeter to make SURE the pin is not connected to to ground. 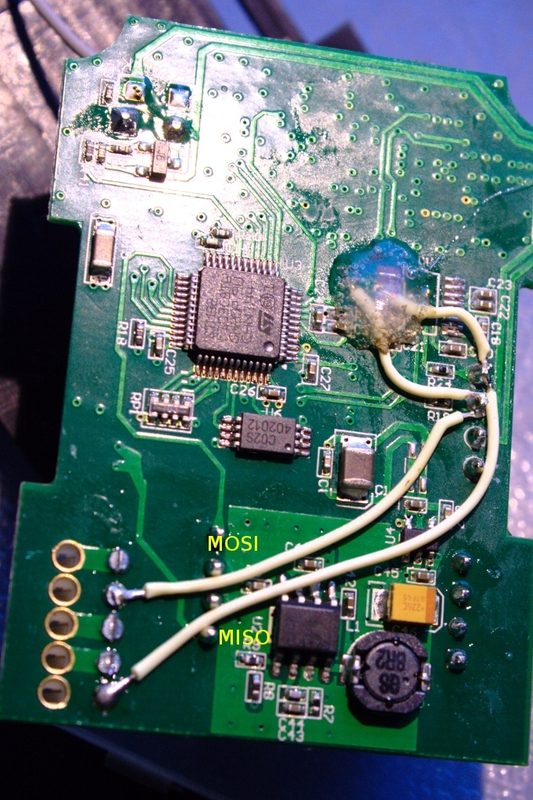 I personally soldered these wires to the ISP connector (D-sub) on the back of my transmitter to where the MOSI and MISO pins go from the AVR. Then we need to modify the FrSky radio module. 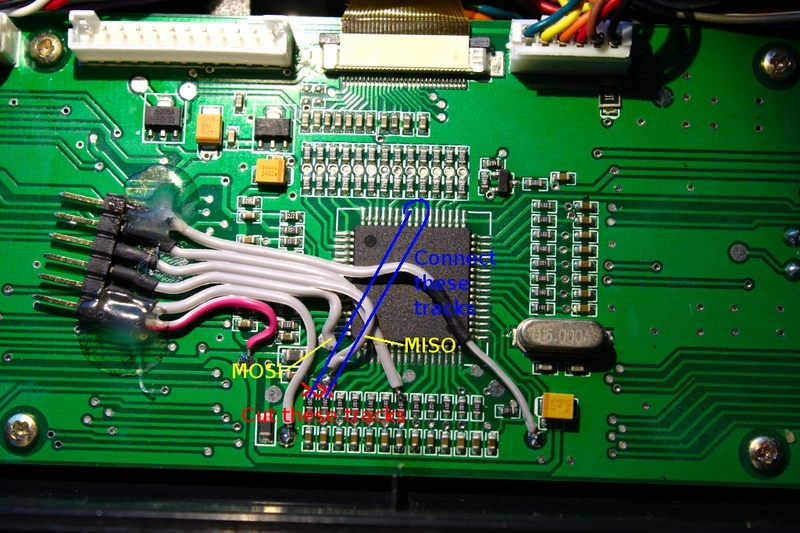 What we are doing is rerouting the serial lines from the FrSky main processor (an STM32 ARM) past the level converter chip (3232) and to the serial connector and the radio module connector. I personally have a v2 FrSky module which has a different PCB than the v1 model. Again, notice the hot glue on the fairly delicate solderings near the U1 chip! The A1 channel is showing the supply voltage for the receiver and A2 is showing main battery voltage (3S). I had to make a voltage divider for the A2 channel so I could measure the battery voltage. Hello, thanks for the tutorial. Quick questions, will I have problems flashing firmware to the Mega64 after removing the chip? Also, what do you mean you used a voltage divider for the A2 channel? Thanks in advance! Hey Manny! I wouldn’t recommend removing the chip for flashing. You need to supply power and ground (and decoupling caps preferably too) to a bunch of pins and it will make it a ton more difficult. For the A2 channel I made my own voltage divider from a couple of resistors to make the voltage suitable to be sensed with the A2 port (which can only take a maximum of 3.3V). I wish I would of waited 🙁 I took off the chip and followed the rest of your tutorial. I just flashed using an Arduino and it seemed to work fine except my THR and AIL switches are glitchy. Any idea what can be the problem? Hey Manny! 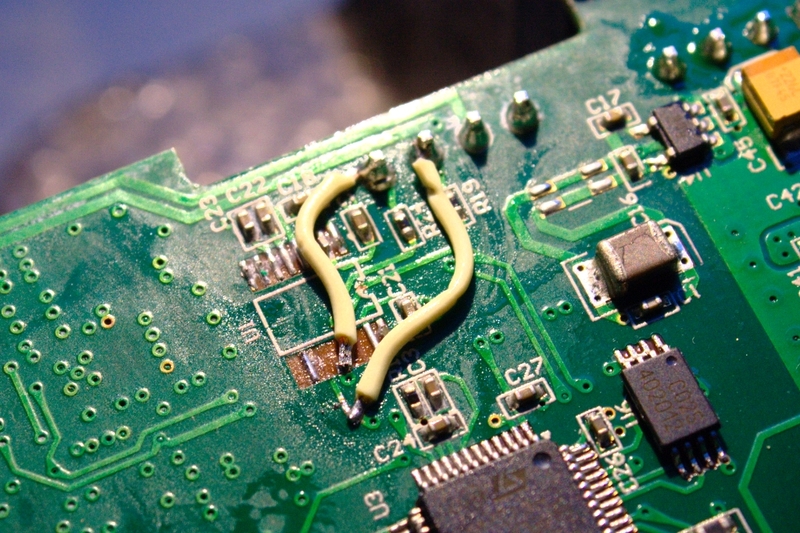 If they’re glitchy it might be due to a bad solder joint. 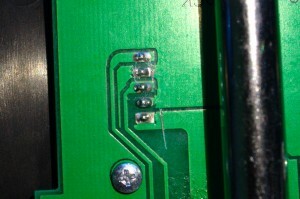 The wires were soldered very poorly in F9X straight from the factory. Hello! I have followed your tutorial, but when I tried to flash the firmware, I could not. My transmitter only says “switch error” even if all my switches are in a good position. When I connect my usbasp to it, it stops, but the usbasp just doesnt work (no leds blinking or glowing). When I remove a jumper on my usbasp, the usbasp starts up, but my transmitter starts to say “switch error” again. What could I possibly do wrong? Thanks! Sorry mate, I have re-read your article, and noted that you have removed the FrSky’s 232 chip. Thus I assume that you do not have any issue with the ‘clicking sound’. Why I was asking is that I wish to keep the RS232 (probably output only) available from the module as well as the new internal connection to the 9x’s AVR. Can you offer any idea how I could think about isolating the new TTL tap from the existing circuit, so that both levels may be utilised simultaneously? Hey Ryan! You mean you want both the TTL level and the MAX232 output on your module? 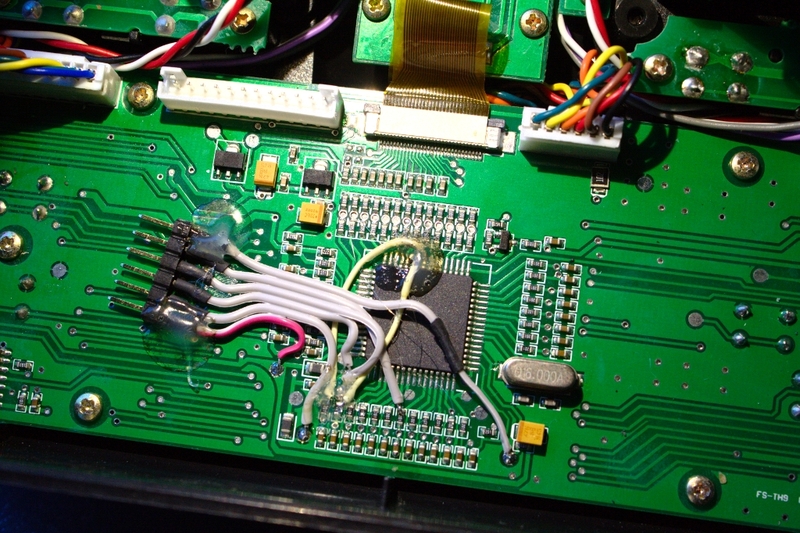 You could just leave the MAX232 soldered on, and just reroute the TTL-level traces to the module pins. Then you would have the MAX232 output/input on the module connector (on top) and the TTL-level RS232 in the module connector (that goes to the radio). I have not noticed any clicking noises but as you said I don’t have the MAX232. Thanks for the info, Yes, I wish to keep the existing RS232 level for connection to a PC, Probably only the Tx line will be required in this case. It has been suggested to me, that the serial lines could be picking up signals/interference from the adjacent 2.4Ghz transceiver, and perhaps this is somehow inducing the noise. In this case shielded twin and/or twisted pair may reduce/eliminate the noise that some people have found. On past micro controller projects, I have done similar to what you have described (not with a MAX232, but simple transistor circuit) as I assumed this to be the appropriate way, and have not noticed any issues, so when my FrSky turns up, I will just try it and see! Thanks again for sharing your article! Thanks for sharing your solution, you have done a very nice job! Overall, it is a much neater solution so much neater that some other methods! I am curious, though, some others doing a similar method have reported a ‘clicking sound’, presumably from have the existing MAX232 in the FrSky still in circuit. http://www.rcgroups.com/forums/showthread.php?t=1510047 In particular post #37 advocates removal of the chip entirely! Have you seen/heard this sound with you mod?